The dead have been spat on and I am roaring for their ghosts. Last night Hilary Benn, Shadow Foreign Secretary and the son of the late, great Tony Benn, stood up in Parliament and said, " . . . what we know about fascists is that they need to be defeated. And it is why . . . socialists and trade unionists and others joined the International Brigade in the 1930s to fight against Franco. It's why this entire House stood up against Hitler and Mussolini. It is why our party has always stood up against the denial of human rights and for justice . . . It is now time for us to do our bit in Syria. And that is why I ask my colleagues to vote for the option tonight." And to my horror, Hilary Benn was applauded for these words. For the last four and a half years, I have devoted myself to researching and writing a novel about the Spanish Civil War. For the Right Honourable Hilary Benn to invoke the International Brigades as a justification to join others blindly bombing Syria is not only odious, it is historically inaccurate. 16 February: The Popular Front, a left coalition, wins the election and forms a new Republican government. 17 July: Several Spanish generals, including Francisco Franco, stage a coup d'etat to topple the democratically-elected government. This uprising occurs in Spanish Morocco, then a protectorate, and quickly spreads to cities and army bases on the mainland. 20 July: Rebel sympathisers inside Madrid are defeated. The Republican government requests aid from France. The rebels request assistance from Germany and Italy. 25 July: Hitler agrees to support Franco. 26 July: German and Italian planes land in Morocco to fly the Army of Africa* to the Iberian peninsula to seize power. August: Great Britain proposes a plan of non-intervention that would refuse aid to either side. 14 August: On their drive to Madrid, rebel troops massacre 2,000 to 4,000 civilians and Republican militia in Badajoz. 9 September: The Non-Intervention Committee meets in London under the auspices of Tory Prime Minister, Stanley Baldwin, to draw up a treaty that bars the citizens of signatory countries from supplying men, or armaments, to either side. Ultimately, twenty-four nations sign including Britain, France, Germany, Italy and Russia. 2 November: Madrid is almost encircled by insurgents. The 2.5-year siege of the capital begins. 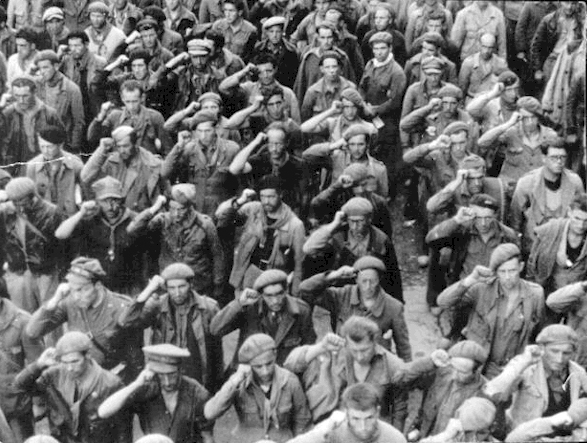 8 November: The first members of the International Brigades arrive to help defend Madrid. The International Brigades were men and women from 56 nations who came to Spain to defend freedom, most of them against the wishes of their own government. The greatest numbers who enlisted were French citizens, followed by stateless Germans who were opposed to Hitler's National Socialism, Italians and Poles. There were British, American, Canadian and Yugoslav battalions. Some of those who volunteered came from as far away as Iraq and China. The Abraham Lincoln Battalion was the first US military unit to be commanded by an Afro-American. The men and women of the IB did not fight for money or glory. Their daily pay was enough to buy a cup of coffee and a roll. Many, on their arrival in Spain, were surprised that they would receive any pay at all. They called it "the pure war" because those who came were not conscripts or mercenaries. 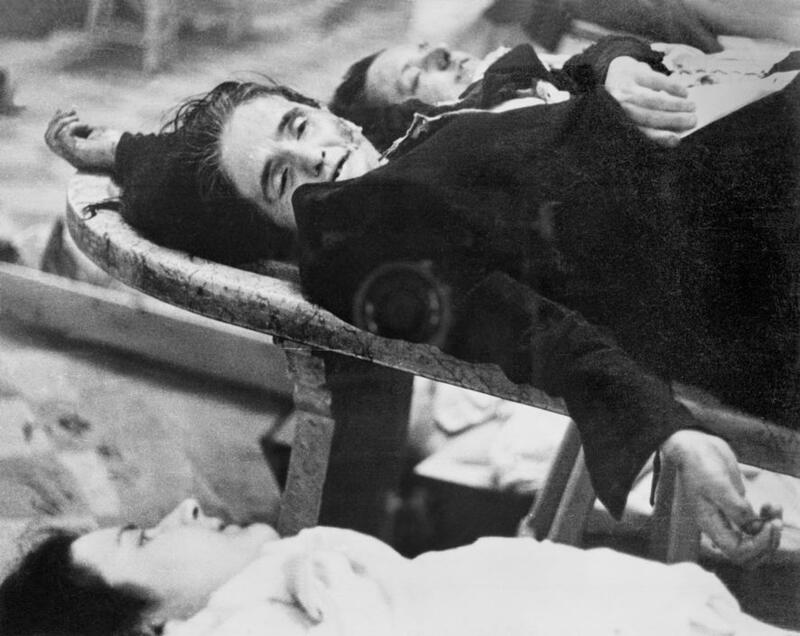 They were idealists, terrified that Spain would mark the dress rehearsal for another world war, as indeed it was with the first carpet bombing of civilians rather than military targets. Used as shock troops, more than half the International Brigades were killed. Men and women who were so dedicated to fighting the fascists that even those in their hospital beds—if they were able to walk—would voluntarily return to the front line when another battle was in the offing. The war in Syria is not about fascism. It is about access to oil. Crude oil. The RAF bombers are part of a professional army co-opted to enrich the coffers of the arms' industry. It was truly shocking to discover on the Campaign Against Arms Trade website that Members of Parliament were among those on the guest list at the ADS (Aerospace, Defense and Security) Dinner on 2 February 2015. If you doubt me, here is the link. "Today many are departing. Thousands remain, shrouded in Spanish earth, profoundly remembered by all Spaniards. Comrades of the International Brigades: political reasons, reasons of state, the welfare of that very cause for which you offered your blood with boundless generosity, are sending you back, some to your own countries and others to forced exile. You can go proudly. You are history. You are legend. You are the heroic example of democracy's solidarity and universality in the face of . . . those who interpret democratic principles with their eyes on hoards of wealth or corporate shares which they want to safeguard from all risk. We shall not forget you . . ."
Hilary Benn, you may have forgotten why the International Brigades fought, and what they stood for, but I have not.